Tweetbot's latest update brings it back into closer alignment with Twitter's own look, but it continues to have its own excellent approach. You’ll find fewer enmities so fierce and opinions as strong as which Twitter client is the best—at least among Twitter enthusiasts and obsessives, who may resemble this reviewer. Tweetbot has been my client of choice for years, for both iOS and OS X, and despite dabbling with other software options—including Twitter’s own releases—I’ve stuck with the Tapbots products. Tweetbot 4 for iOS ($10) is now out, and shows why my trust is well placed: The product continues to mature and deepen, incorporating a lot of small, welcome changes and building in new features made available by Twitter, as well as adding some large ones. Notably, a new statistics and activity view gives you quick and easy insight into how people are reacting to what you tweet. The biggest improvement you’ll see on iPhone screens is landscape support, while the iPad and iPhone 6 Plus and 6s Plus receive a new column view, allowing side-by-side displays within the app. The image picker is enormously faster and better as well. 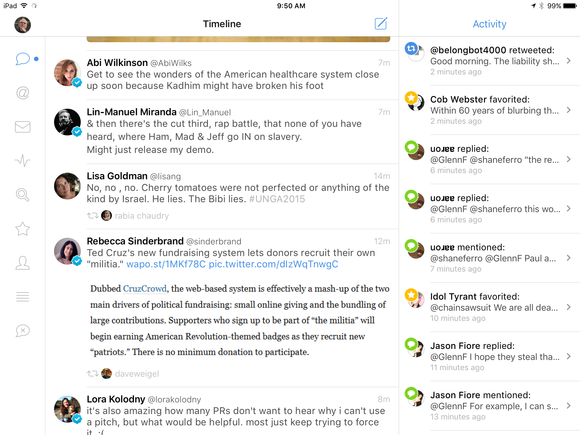 Tweetbot offers its own configurable split-pane mode for iPad and Plus models of iPhone. Why pick a third-party client at all? The biggest question for any Twitter client is: Why not just choose the free software provided by Twitter or use its mobile-optimized website? On the former score, Twitter’s software immediately adds any new features the social network deploys, letting third parties wait for an official developer release. But it’s kind of a mess. The interface is outdated and, to my eye, aesthetically unpleasing. The organization of messages and tabs is tied to what Twitter finds important as a business—an advertising business—more than what you might want to focus on as a reader or poster. And it makes bad use of screen territory, with no landscape mode for the iPhone and a poor one for iPad. Its only advantage currently? It allows multi-person direct messages (DMs), a feature it hasn’t rolled out to third-party apps yet. Tweetbot better reflects how I use Twitter, keeping categories and kinds of things separate. Most critically, it incorporates a sophisticated set of mute options, which can be used effectively to avoid unfollowing or blocking people or groups during periods of time (or even forever) that you don’t want to have their tweets in your timeline. At $10—$5 during an introductory period—I have a hard time arguing against its value, especially for those who post from more than one Twitter account. When launching Tweetbot for the first time, you’ll find that it has already picked up the Twitter accounts you’ve already entered in iOS. You can also add other accounts manually within the program. For those who manage multiple accounts for fun, work, or profit, Tweetbot has easy ways to swap among them. I have one favorite minor feature: When you tap your account’s avatar and it drops down the avis for other accounts, you can tap, hold down, and rearrange the order in which accounts appears in that list. Swiping left across the top lets you cycle through accounts, and you can also tap the avatar in a new message to choose a different account from which to post. Each account can have separate settings for uploading images, videos, marking the last-read tweet, read-later saving, and URL shortening. Some of these default to Twitter’s options, but Tweetbot supports major alternate services. The iPhone and iPad versions take different advantage of the territory. On the iPhone, icons along the bottom allow access to your timeline, mentions (those @ replies), direct messages, and two user-selectable options from six remaining choices: Search/trending, faves, lists, mute, profile, and activity/stats. The iPad versions shows all nine options along the left-hand side. Tweetbot also stores drafts. When composing a message, you can tap Close, and you’re prompted to either save as a draft or delete it all together. While the OS X version has a separate Drafts window, I’ve always thought it clever that Tweetbot for iOS puts a Drafts button in the new message dialog. Tap it, and you can select from outstanding drafts or delete them. Location support allows dropping in precise coordinates or choosing from a list of suggested nearby named places. The Drafts feature retains thoughts for later retrieval. The robust threading support in Tweetbot lets you follow often lengthy discussions, and dive deep to see offshoots. Swipe left on any tweet, and messages that precede and follow it—using Twitter’s threading data—are shown above and below. 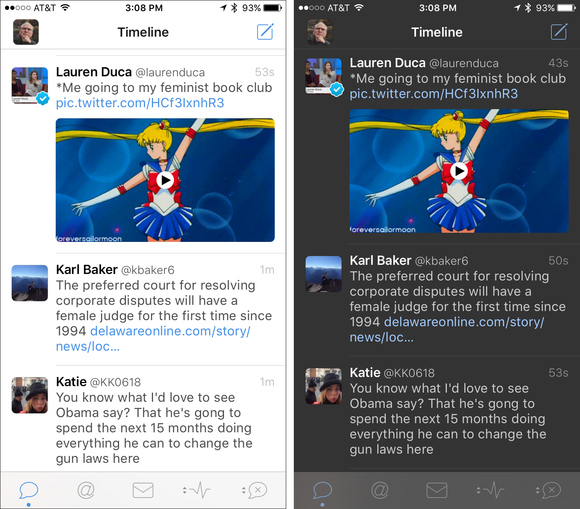 Tweetbot 4 for iOS reverses the chronology of its previous threading behavior, however. In this version, the current tweet is shown at the top of the screen, and newer replies below. However, if there are preceding tweets, swiping down reveals those. This change was introduced during beta testing, and I found it horrible at first—and then gradually got used to it. It makes more logical sense, and I adjusted. The one flaw Tweetbot has related to threading occurs when you reply to your own tweet. If you want to have a sequence of multiple messages that link one to the other, you must reply to the previous one in the chain for Twitter to record the order properly. Some third-party clients highlight your @handle in such a reply so you can start tapping and erase it as a default choice. Tweetbot does not, though it does remove your handle in threading replies to others. I’ll admit I have a bit of interest in knowing which of my tweets people seem to care about, and the Stats panel feeds my pitiful ego. It shows an interaction summary at the top: Faves received, number of retweets, and a count of new followers. Below, it lists all of yours tweets that someone has interacted with, showing in separately color-coded favorite and retweet/quote bars the quantity. Tap the Activity tab at the top, and you can see each interaction, one at a time. A new Stats tab helps inform you about interactions on your tweet—and maybe feeds your ego. On an iPhone 6 Plus, 6s Plus, or an iPad, you’ll get an extra column that lets you monitor activity, shows stats, see mentions, follow a list, or match stored searches—just rotate your device to landscape mode. This is a neat echo of the new split-screen and slide-over views available on some iOS devices, but entirely within the app. There’s a load of other updates, too. Tweetbot takes advantage of Apple’s new Safari View Controller to load webpages. This uses a full-fledged version of Safari within the app, including honoring content-blocking extensions. It’s more robust and faster than the only previous alternative offered to iOS developers. 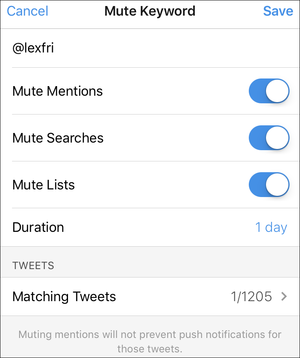 As before, you can mute by handle, keyword, hashtag, or Twitter client, and for a period of one day, one week, one month, or forever. These tweets are silently removed from Tweetbot. The new versions lets you add users and hashtags directly from the Mute view—before, you had to find an example and use a mute control to add it. Mute for everything but clients now offers pulling matches out of not just your timeline and mentions, but also in search results and lists. Attaching images is substantially better in this release than in previous ones. With iCloud Photo Library, I have tens of thousands of images loaded in “optimized” form on my iPhone. 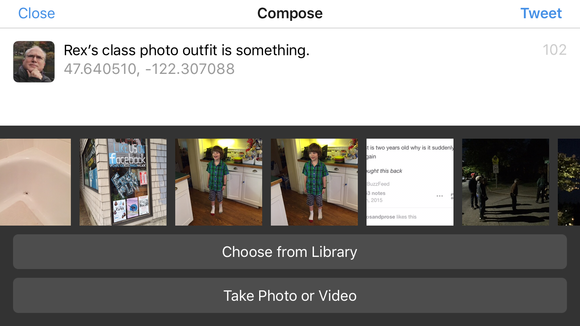 Tapping to add an image from the library took seconds on an iPhone 6 for the selector to appear. Now a side-scrolling list of thumbnails appears nearly instantly for the most recent images, and you can tap to examine the library more fully or take a picture. An improved image selector comes up quickly and shows thumbnails. Though it may seem minor, being able to view Tweetbot on any iOS device in both portrait and landscape modes is a nice change, especially with the new Safari controller support, which makes it more likely I’m reading webpages inside Tweetbot instead of leaving for Safari. It’s like day and night, the difference between these light and dark modes. Finally, if you’re a tweet-somniac, a simpler way to access night mode swaps white for a chocolatey dark brown with a two-finger swipe up; take two fingers and swipe down to reverse back to daytime. Twitter has been pushing back against third-party clients for years, which must be nerve wracking for any developer putting time into a client. And Tweetbot doesn’t include Twitter’s ads, although it may be required to at some point. However, outside developers and individual users built, named, or inspired much of what we think of as Twitter. Tapbots’ continued work hasn’t stalled. They’re hampered only by what Twitter exposes to them, and lets them incorporate. Let’s hope that continues, and this excellent option outside the social network’s more modest user software continues to thrive. Because Apple doesn’t offer trials in the App Store, there’s no way to test out Tweetbot without purchasing it. However, owners of previous releases can buy version 4 at a quasi-upgrade price during the current introductory promotion. Or, after the price is set to $10, Tapbots says it will release a “bundle” for Tweetbot 3 owners that includes Tweetbot 4. The “complete this bundle” price will be $5. 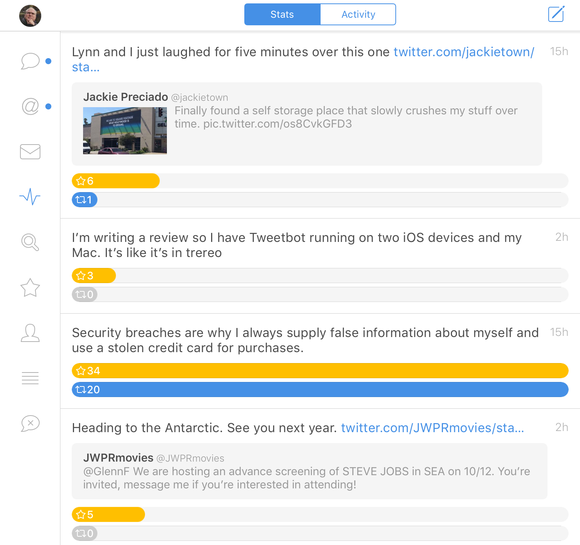 Tweetbot 4 introduces a new statistics and activity view that gives you quick and easy insight into how people are reacting to what you tweet, solidifying Tweetbot's status as one of the best Twitter clients out there.